Patient Zero is a great American horror and action movie that features horde of zombies. Earth’s population is in the verge of extinction after six billion people contaminated with a deadly virus that turns people into a mindless and living-dead zombies. The people who were able to survive are still trying their best to stay alive in the tunnels and in the bunker. The armed forces of the Earth are joining forces together to fight against the zombies and to keep the people away from the virus. This time around is not about survival only but it is also a battle between two different human creatures (human versus zombies). This is an epic film since the zombie movie genre has evolved from finding a cure to a man with the ability to speak to the zombies. Every time the soldiers captured important or unique zombies they will study it with the medical team and communicate it with a soldier who is bitten by zombies but did not turned into a zombie. The soldier’s task is to find the Patient Zero which is very impossible. Until one day they capture a very unique zombie that can talk to humans found out that he is the one that they’ve been looking for, the Patient Zero. 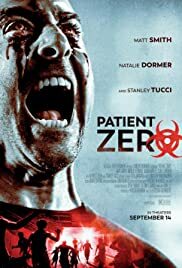 The Patient Zero is the person who is the carrier of the virus and the doctors believe that his blood would be the cure or antidote to the virus. Nonetheless the zombie horde will not stop until the rest of the people turn into zombies.